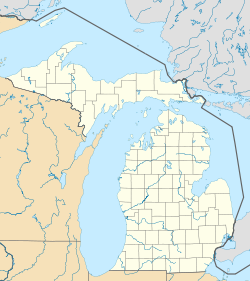 West Bloomfield Township, officially the Charter Township of West Bloomfield, is a charter township in Oakland County in the U.S. state of Michigan, within the Detroit metropolitan area. It is one of the most expensive places to live in Oakland County. As of the 2010 census, the township had a population of 64,690. Westacres is an unincorporated community in the township at Keith and Commerce Roads (42°36′00″N 83°25′30″W﻿ / ﻿42.60000°N 83.42500°W﻿ / 42.60000; -83.42500 Elevation: 925 ft./282 m.). West Bloomfield is sometimes referred to by its residents as the "lake township of Oakland County", being heavily dotted with small and medium-sized lakes. Cass Lake, the largest lake in the county, is in part of West Bloomfield, and Pine Lake, which has a private country club on its shore, is only a few miles away from Cass and lies completely within West Bloomfield. In addition, directly west of Pine Lake is Orchard Lake, which also has a private country club on its shore. Orchard Lake is surrounded by the city of Orchard Lake Village. Several smaller lakes are scattered around these larger ones. Orchard Lake Road runs north-south through the middle of the township and is the main artery of West Bloomfield's economy along with West Maple Road (15 Mile Rd. ), flanked on each side by long strip malls and shopping complexes. There are many high-end boutique stores and expensive restaurants to visit. Most of the township's population growth has occurred since the 1960s, as many residents moved there from the inner ring Detroit suburbs. West Bloomfield is located in south-central Oakland County about 10 miles (20 km) to the northwest from the Detroit city limits and has borders with Bloomfield Township to its east, Farmington Hills to its south, Commerce Township to its west, and four communities to its north: Waterford Township, Orchard Lake Village, Keego Harbor, and Sylvan Lake. The communities of West Bloomfield, Orchard Lake Village, Keego Harbor, and Sylvan Lake make up what is known as Greater West Bloomfield. According to the United States Census Bureau, the township has a total area of 31.2 square miles (81 km2), of which 27.3 square miles (71 km2) is land and 3.9 square miles (10 km2), or 12.49%, is water. The school districts that serve the town include the West Bloomfield School District, Waterford School District, Farmington Public Schools, Birmingham City School District, Pontiac School District, Walled Lake School District, and the Bloomfield Hills School District. West Bloomfield High School, the Frankel Jewish Academy of Metropolitan Detroit and St. Mary's Preparatory are the only three high schools located within Greater West Bloomfield. The West Bloomfield Township Public Library serves West Bloomfield. In 1999 this library and the Awaji City Library in Awaji, Hyogo, Japan were paired as sister institutions. As of the census of 2010, there were 64,690 people, 24,411 households, and 18,040 families residing in the township. The population density was 2,374.3 per square mile (916.6/km²). There were 24,410 housing units at an average density of 893.6 per square mile (345.0/km²). The racial makeup of the township was 77.6% White, 11.4% Black or African American, 0.1% Native American, 8.4% Asian, 0.02% Pacific Islander, 0.4% from other races, and 2.0% from two or more races. Hispanic or Latino of any race were 1.60% of the population. As of the census of 2000, there were 64,860 people, 23,414 households, and 18,192 families residing in the township. The population density was 2,374.3 per square mile (916.6/km²). There were 24,410 housing units at an average density of 893.6 per square mile (345.0/km²). The racial makeup of the township was 84.25% White, 5.18% Black or African American, 0.12% Native American, 7.81% Asian, 0.02% Pacific Islander, 0.38% from other races, and 2.25% from two or more races. Hispanic or Latino of any race were 1.40% of the population. There were 23,414 households out of which 37.0% had children under the age of 18 living with them, 69.5% were married couples living together, 5.8% had a female householder with no husband present, and 22.3% were non-families. 19.4% of all households were made up of individuals and 7.5% had someone living alone who was 65 years of age or older. The average household size was 2.74 and the average family size was 3.17. In the township the population was spread out with 26.4% under the age of 18, 5.2% from 18 to 24, 27.1% from 25 to 44, 27.9% from 45 to 64, and 13.4% who were 65 years of age or older. The median age was 40 years. For every 100 females, there were 96.8 males. For every 100 females age 18 and over, there were 92.9 males. According to a 2007 estimate, the median income for a household in the township was $98,832, and the median income for a family was $113,191. Males had a median income of $74,557 versus $45,339 for females. The per capita income for the township was $44,885. About 1.6% of families and 2.7% of the population were below the poverty line, including 3.0% of those under age 18 and 2.6% of those age 65 and over. West Bloomfield has a large Jewish population. It is home to the Jewish Community Center of Metropolitan Detroit, the Frankel Jewish Academy, a Jewish community high school, and the museum of the Jewish Historical Society of Michigan. West Bloomfield also has a large Chaldean population as of 1990. In 1989 the Chaldean-Iraqi Association of Michigan bought the Shenandoah Golf and Country Club, located across the street from the synagogue Temple Israel. Some homeowners who cited a fear of further development stated opposition to the purchase. Doron P. Levin of The New York Times wrote that "It was never clear whether those objecting were Jewish, but some Chaldeans sensed prejudice." The Chaldean group spent $1 million on renovations on the golf course and the clubhouse. Temple Israel organized social activities welcoming Chaldeans. Levin wrote that "the opposition wasn't vigorous or long-lasting". By 1990 the Jews and Chaldeans in West Bloomfield began to socialize increasingly. By 2004 the Chaldean Cultural Center, the United States's largest Chaldean cultural center, was located in West Bloomfield Township. As of April 2013, West Bloomfield had the third largest Japanese national population in the state of Michigan, at 1,047. ^ "Race, Hispanic or Latino, Age, and Housing Occupancy: 2010 Census Redistricting Data (Public Law 94-171) Summary File (QT-PL), West Bloomfield charter township, Oakland County, Michigan". U.S. Census Bureau, American FactFinder 2. Retrieved August 22, 2011. ^ "West Bloomfield Described," Greater West Bloomfield Historical Society, Accessed June 23, 2007 Archive accessed September 11, 2013. ^ "School District Map 2013" (Archive). West Bloomfield Township. Retrieved on June 30, 2015. ^ Hubred-Golden, Joni. "Students from Japan Visit West Bloomfield Library." (Archive) West Bloomfield Patch. July 31, 2013. Retrieved on November 10, 2013. ^ a b c d Levin, Doron P. "WEST BLOOMFIELD JOURNAL; Jews and Ethnic Iraqis: A Neighborhood's Story." The New York Times. December 17, 1990. Retrieved on September 11, 2013. ^ "Arab, Chaldean, and Middle Eastern Children and Families in the Tri-County Area." (Archive) From a Child's Perspective: Detroit Metropolitan Census 2000 Fact Sheets Series. Wayne State University. Volume 4, Issue 2, February 2004. p. 2/32. Retrieved on November 8, 2013. Wikimedia Commons has media related to West Bloomfield Township, Michigan. This page was last edited on 22 March 2019, at 14:20 (UTC).